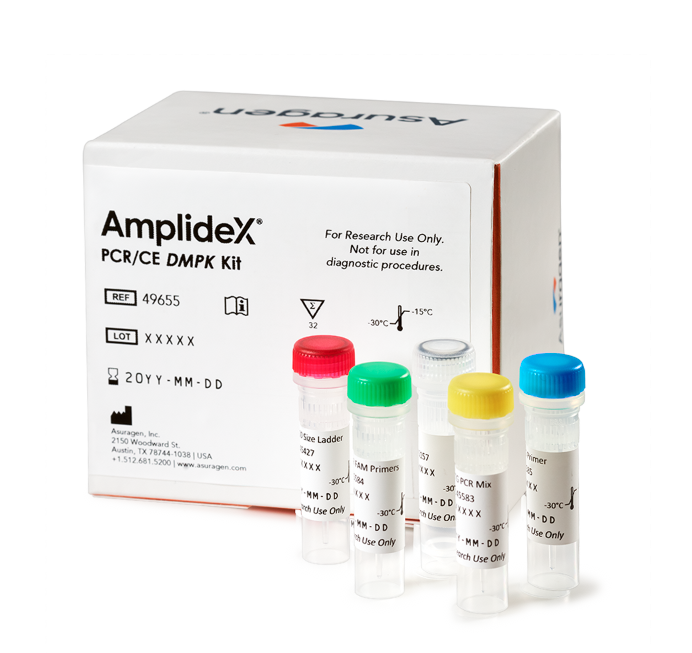 The AmplideX PCR/CE DMPK Kit* introduces a groundbreaking alternative for the detection and sizing of CTG trinucleotide repeats within the DMPK gene. Leveraging the Repeat-Primed PCR (RP-PCR) design in a simple, streamlined, PCR-only workflow, the kit provides an opportunity to replace Southern blot technology and put DMPK analysis within the reach of laboratories everywhere. AmplideX technology has revolutionized how repeat expansions within the FMR1, C9orf72, and TOMM40 genes can be analyzed, significantly expediting time-to-result and reducing the reliance on cumbersome Southern blot analysis. The AmplideX PCR/CE DMPK Kit extends this groundbreaking approach to the DMPK gene, which has long challenged laboratory analysis due to the presence of very large expansions (over 1000 repeats) and a high degree of mosaicism. The DMPK kit, which is for use on widely established CE systems, overcomes these challenges and enables the sensitive detection and sizing of these DMPK repeats all within a single laboratory shift – without the need for Southern blot confirmation. Table 1. Comparison of residual clinical sample results between Asuragen (AmplideX PCR/CE DMPK Kit) and partner lab (PCR + Southern blot). Figure 1. 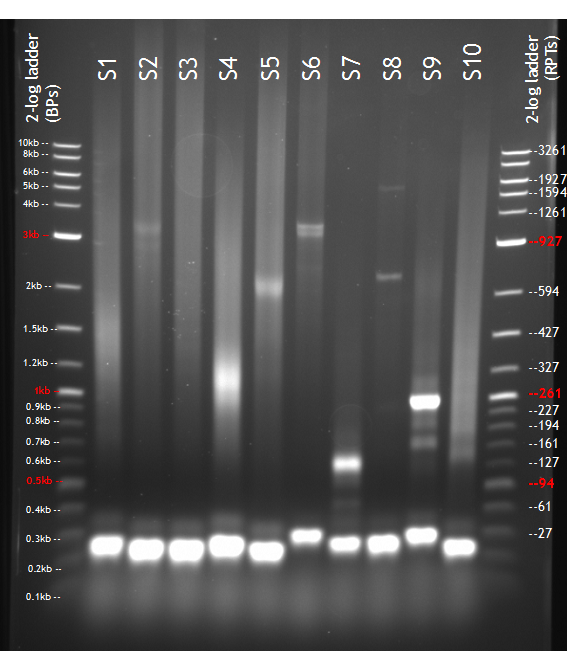 Results of expanded allele analysis using AmplideX AGE protocol. Figure 2: Sensitive and accurate sizing of DMPK expansions up to 200 repeats. Figure 3: Clear resolution of zygosity. Myotonic Dystrophy Type I (DM1, Steinert’s Disease) is an inherited form of muscular dystrophy, affecting 1 in 8,000 people worldwide. Associated with large, CTG trinucleotide expansions in the DMPK gene, laboratories have traditionally been challenged to detect and size these repeat sequences accurately and efficiently. 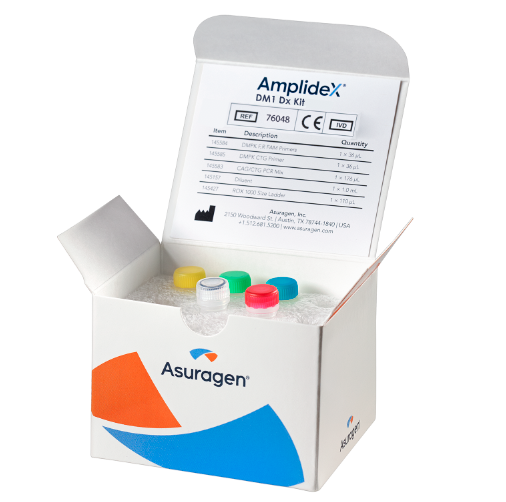 By leveraging proprietary repeat-primed PCR (RP-PCR) technology, the AmplideX DM1 Dx Kit aims to revolutionize the diagnosis of DM1 by providing a simple, sensitive, and streamlined method to analyze DMPK expansions within a single day without the requirement for Southern blot technology. AmplideX technology has revolutionized how repeat expansions within the FMR1, C9orf72, and TOMM40 genes can be analyzed, significantly expediting time-to-result and reducing the reliance on cumbersome Southern blot analysis. The AmplideX DM1 Dx Kit extends this groundbreaking approach to the DMPK gene, which has long challenged laboratory analysis due to the presence of very large expansions (over 1000 repeats) and a high degree of mosaicism. The DM1 Dx kit, which is for use on widely established CE systems, overcomes these challenges and enables the sensitive detection and sizing of these DMPK repeats all within a single laboratory shift. *CE-IVD for US export only.